Damson Technologies, one of the biggest OEM players in the Indian market and a leading manufacturer of computer peripherals, accessories and lifestyle products, today launched the CORSECA Eternia, a retro look Bluetooth speaker. The product is a perfect companion for music fanatics looking for an epic playback performance be it classical opera, rock n roll, hard rock or Bollywood chart-busters. 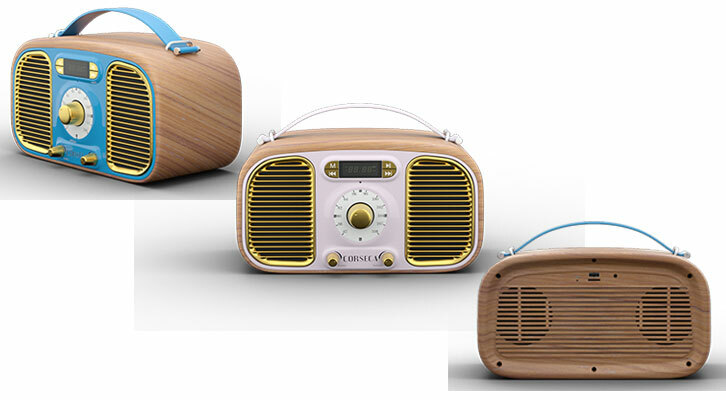 The Corseca Eternia will make you travel to the classic era of artful design and warm music with its retro theme based design. Equipped with latest 4.2 version of Bluetooth, Eternia packs 2 powerful 10Watts RMS drivers & 20WRMS output to regale users with perfect musical balance and tonal quality. The device delivers deep, accurate bass with an impressive frequency range of 70Hz – 20 KHz. Boasting a rechargeable 2400mAh lithium battery the speaker gives more than 8-10 hrs of continuous wireless audio playing. With different connectivity options such as; Bluetooth, USB, TF Card Reader, AUX in Port and FM, Eternia lets users enjoy music in multiple forms. Boasting excellent sound quality in retro design, these speakers are the ideal combination of style and performance.